Q: What is NOAA Weather Radio? A: For information on this subject, please visit the NOAA Weather Radio information page; the page you are viewing is designed to help you tune into the Internet broadcasts. Q: How can I listen in to the products in the NWR broadcast cycle? A: First of all, you'll need a media player installed on your PC. Most Windows 98 or later computers already have one already installed, so you may not have to download any special software. Second of all, you'll need to be connected to the Internet at 14.4 Kbps or faster; we recommend a 28.8 Kbps connection or better for best results. Click on the MP3 link for the NWR product you wish to listen to, and your default media player will load and play the clip. If you click on a link and nothing happens, or the clip does not play normally, rebooting (restarting) your PC will most likely clear up the problem. Q: Is this a live broadcast? A: The audio MP3 files you are listening to on the Internet are a direct representation of what is being transmitted live from the N.O.A.A. transmitter in Phoenix, each product in the NWR broadcast cycle has been encoded as an MP3 file and placed onto the N.O.A.A. Phoenix web server so that you may listen to it. 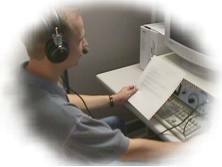 Each time the a product in the broadcast cycle is updated, a new MP3 file is encoded, so that whatever you are listening to is always current. To play a topic, within the lists below, click on the play button. (such as AMBER alerts or 911 Telephone outages). The best example of a monsoon on Earth occurs over the Indian sub continent. During the months of April through October, a moist southwest wind brings heavy rains to this region...while a dry northeast wind is prevalent during the remainder of the year. In North America, a similar situation occurs over much of Mexico. For example, in Acapulco, rainfall averages 51.8 inches during the months of June through October...while only 3.3 inches falls during the remainder of the year. In the United States, Arizona and New Mexico are located on the northern fringe of the Mexican Monsoon. For most of the year, winds aloft over the southwest U.S. are west to northwest. During the summer, winds turn to a more south to southeast direction, importing moisture from the Pacific Ocean, the Gulf of California and the Gulf of Mexico.